That was some juicy roast pork. 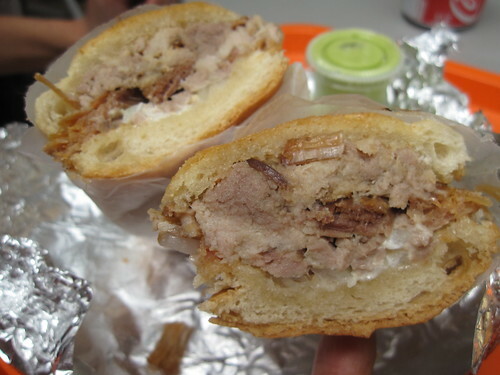 With some high remarks from Midtown Lunch, we were excited to try the pernil sandwich at Sophie's. We didn't get it with the plantains as recommended but we did get the special combo, which gives you a full serving of rice and beans with your sandwich. That's a great deal for $7. We split it between the two of us and didn't finish it. The bread was a bit crap, but the pork was distracting enough to not make the eating experience a downer.